How much does air conditioning cost? You might very well be wondering that right about now, given that the steamy weather all but demands you crank up your AC. Sure, it feels great, but you pay the price once your electric bill arrives. But how much should you expect that to be? Of course, how much you pay will vary based on the climate where you live, the size of the home being cooled, how much you pay for power, and more. But here are some rules of thumb so you know approximately what to expect. Does it look like you’ll be spending a small fortune to cool your home this summer? Don’t panic, yet. There are a few things you can do to cut costs. The upfront cost could save you money over time. If you’re installing a new system, make sure your AC company measures your home and provides you with the best fit. Energy Star units, that is. This designation indicates energy efficiency, which basically comes down to the fact that the unit uses less energy and costs less money to run. Energy Star units typically use 8% less energy and can save you at least $70 a year. Even if you don’t have the dough to buy a new AC unit, installing a high-efficiency filter in your existing unit can work wonders on its own for a fraction of the price. You can program your thermostat so the house is warmer when you’re away at work, for example. Here’s how to install a thermostat. Of course, 60 degrees sounds delicious when it’s 90 degrees outside. But the truth is, even 75 will feel significantly cooler and cost much less to maintain. A good rule of thumb is to set your thermostat for 15 degrees cooler than the outside temperature. Narrowing that temperature difference by even a degree or two can save you a surprising amount, though. Depending on where you live, you could save 10% to 15% per degree on your energy bill. Your AC works less efficiently when its filters are clogged and its coils are coated in dust and debris. So clean those coils and replace filters every month or two (or as needed) to keep air flowing freely. Every spring, have an air-conditioning contractor inspect your air-conditioning system. This professional can fix any problems that will cost you more later, if neglected. The pro can also do that AC coil cleaning for you. Good insulation doesn’t just save your heating bill. It saves your cooling bill as well. Check the insulation for your home and your air-conditioning system. Make sure your windows are well-sealed so cool air isn’t leaking out. Here’s how to caulk windows and other cracks, and how to insulate an attic. Don’t overlook this seemingly obvious tactic. Make a point of covering your windows as much as possible during the hotter parts of the day. 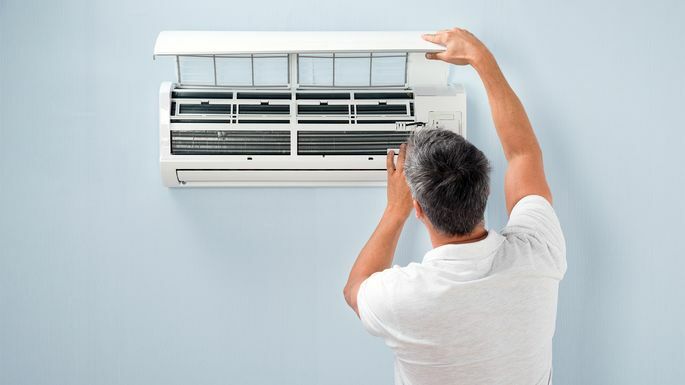 Sure, a lot of these energy-efficient upgrades might cost money upfront, but in addition to saving you in the long run, the local and federal governments offer tax breaks for adding energy-efficient features to your home, including AC. You can search for your state’s tax credits and rebates at energy.gov/savings.